My dad was a pretty awesome guy and an amazing father. He worked hard to make sure that we had a comfortable life, which we totally did. By no means were we ever rolling in money, but I didn't grow up in near poverty like he did. When he was 16 years old, his mother passed away from a heart attack and I believe 2 years after that, his father died of cancer. He rarely talked about his childhood, to me anyway, but I will never forget what he said to me one time. "Shannon, I came home from football practice one day and all of a sudden I didn't have a mother, so don't ever take your mother for granted." He definitely made sure that I treated my mother will love and respect (which I totally would have anyway because she is the most wonderful, amazing person I know). He looks so enthused! Circa late 70s. Of course, he and I butted heads there a few times when I started getting brave enough to try him, but I see now that it was because we were way too much alike. I mean, scarily alike. And now that I'm a parent, I can totally hear my him in my voice and see him in my actions when I have to discipline the little princess. And speaking of the princess, I SO wish he were here to see her. I would love to see him just fall absolutely in love with her. He would never admit it, but he totally would be wrapped around her little finger. So, today, on the 10th anniversary of heaven gaining a terrific man, I made a Bourbon Pecan Pie in remembrance of my dad. He loved bourbon (as do I) and he loved pecan pie. I really think he would love the marriage of the two. *NOTE - Now, please don't send me messages about how you see a George Dickel bottle in the background of this post and that Dickel is whiskey NOT bourbon. I know this. It's Tennessee whiskey and it's awesome, and just like my dad, it is what I always drink. In a medium mixing bowl, whisk together the flour, sugar, and salt. Toss the cold cubed butter into the flour mixture and the pour into a food processor and pulse in short bursts until the pieces of butter are the size of hazelnuts. Dust a clean work surface with flour and unwrap the ball of chilled pie dough and place on prepared work surface. Roll out the dough into a 12-inch round and then transfer the dough to a pie dish and carefully work it into the dish, folding any overhand under and crimping the edge as you go. Place the crust in the freezer while you make the rest of the pie ingredients. Preheat the oven to 325 degrees. Take about 3/4 cup of the toasted pecans and coarsely chop them, then set aside. In a large mixing bowl, whisk the eggs together until combined. Next, add the corn syrup, sugars, butter, salt, vanilla extract, and bourbon. Whisk again until combined. Stir in the chopped pecans. Then, get the crust out of the freezer and pour the filling into the pie shell. Arrange the remaining 1 1/4 cups pecan halves on top of the filling. Bake in the center of the oven for 30 minutes, then cover the edges of the crust loosely with foil and bake for another 30 minutes. Test the pie by sticking a knife in the center of the filling. If the knife comes out clean, the pie is done. If the knife comes out with clumps of filling sticking to it, bake 5 minutes longer and then retest. Cool the pie on a wire rack and serve warm or at room temperature. Store the pie in the fridge, tightly covered, for up to 2 days. Aw, what a sweet post about your dad. I wish I could have met him seeing as your whole fam rocks, I'm sure he did, too. Anything with bourbon/whiskey, I'm in! 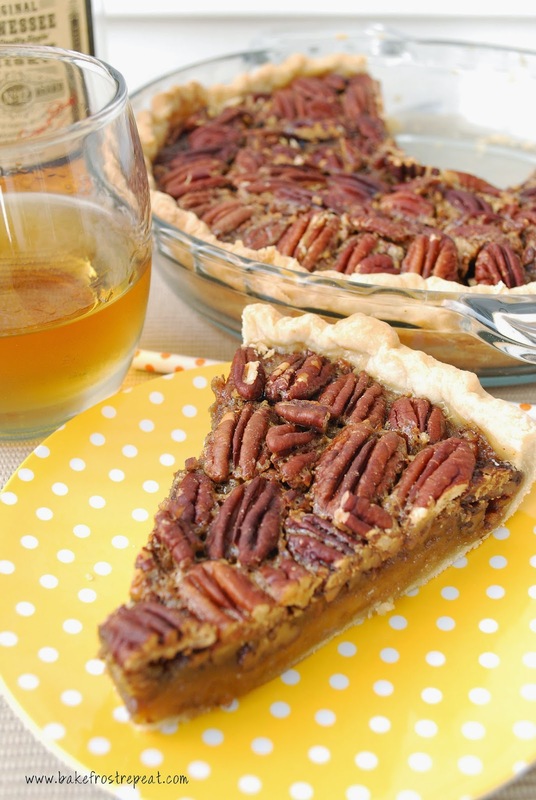 I love pecan pie, and this looks decadent! This pie sounds amazing! 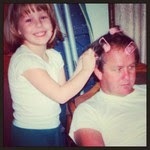 I lost my dad way too early too - I sure wish he could be here to watch my kids grow up.